You're not a member of Cycle Toronto. Join today and add your voice to the call for a cycling-friendly city. 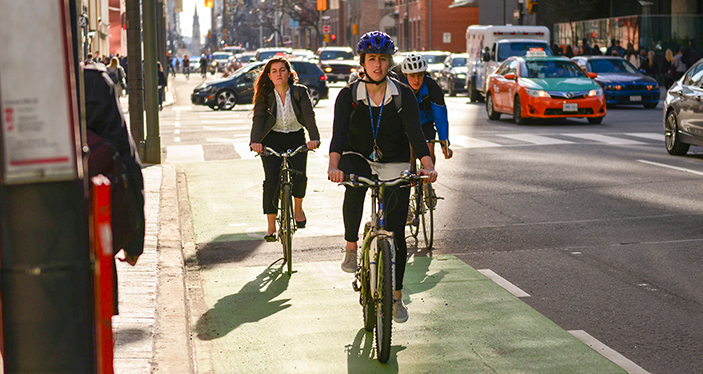 Council’s first meeting of the year brought a unanimous vote (22-0) to make the Richmond, Adelaide, and Simcoe cycle tracks permanent, on the recommendations of a staff report revealing incredible increases in ridership. We’ve worked tirelessly over nearly a decade to make these lanes permanent and were thrilled to see the unanimous decision! The vote also means the Adelaide cycle tracks will be flipped from the south to the north side of the street. The move to the north side ensures the whole corridor will be fully protected. We were concerned about intersection design and were pleased to see council adopt Councillor Layton’s motion to ensure staff evaluate adding protected phases for left turns at all intersections. Watch this video by member Low VELOcity Cycling, to learn how Richmond and Adelaide came to be. Sign up to our Action Alerts list to find out how to plug into campaigns to get more bike lanes built. We are continuing to develop our plans to bring 529 Garage to Toronto. We are in dialogue with the City of Toronto and the Toronto Police Service, and plan to continue building these partnerships into the spring. 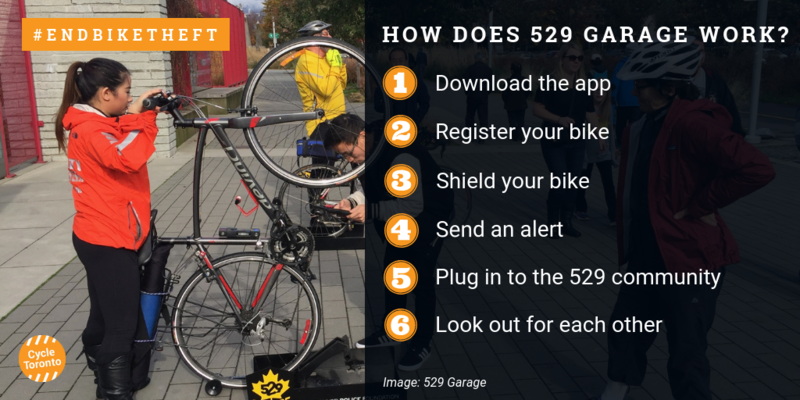 Visit our new #EndBikeTheft page to find out how Project 529 could dramatically reduce bike theft in Toronto. 529 Garage has been transformative in Vancouver. We're working to bring it to Toronto. We know things have been feeling treacherous out there. With this wild winter weather—snowstorms, freezing rain, slush—it’s more important than ever to ensure that people can ride their bikes year-round. Earlier this week, we were happy to see Mayor Tory’s support for reviewing snow removal services, which includes clearing sidewalks and bike lanes. Wondering how to plan your commute so that you can get where you need to go safely and arrive on time? Check out our Cycling Snow Routes blogpost to find out how to plan a winter route, quickly report snow in the bike lane, and advocate for better biking conditions, year-round. 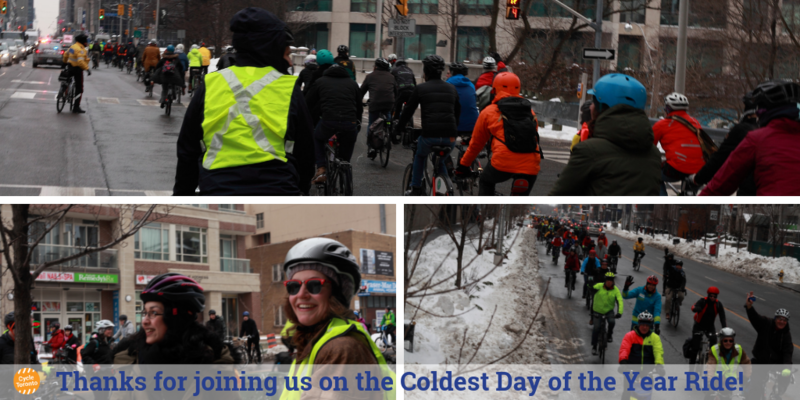 On Saturday, February 2, we welcomed nearly 150 riders to our annual Coldest Day of the Year Ride: Groundhog Day Edition. Like last year, we began our ride on the Danforth to bring attention to the fact that...nothing has changed. Our cheeky theme garnered media attention from outlets including CTV (starts at 9:16; sign-in required to watch) and Global News (starts at 5:10). We know that the lack of cleared and protected cycling infrastructure is holding people back from riding. We need action now to create a safe city-wide grid of protected bike lanes. Visit our Danforth Loves Bikes campaign page to get the latest on efforts to bring bike lanes to the Danforth and complete a vital east-west corridor. Thank you to the Toronto Police and Bike Share Toronto for supporting this ride. Check out our photo album for highlights. 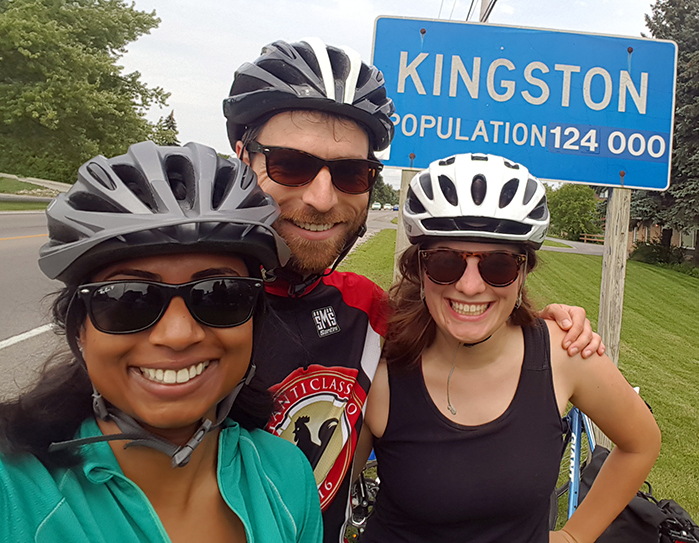 That’s why this Valentine’s Day we’re asking you: how has riding a bike led to finding your people, whether it’s bike love, bike buddies, or a riding group? Tell us your stories on social media tagging us @CycleToronto using #BikeLove and we’ll retweet or share them. Please share your #BikeLove snaps and stories with us on Twitter, Instagram, and Facebook. Do you love cycling and working with people? We may have the job for you. 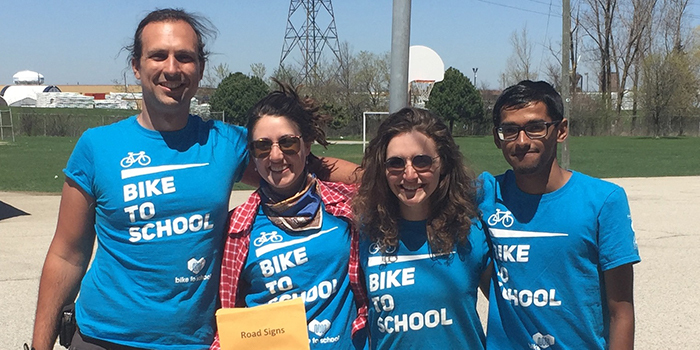 Cycle Toronto and CultureLink’s cycling programs are hiring Cycling Educators and Ride Guides for our busy outreach season. Please click here for more information and to apply. The deadline is Monday February 18, 2019. Last month, Ben Spurr reported Mayor John Tory's comments about a community meeting in Thorncliffe Park, where, as Tory stated, "residents of that community were telling me unanimously that the bike lanes we did put in in 2018 should be taken out" in order to restore lost on-street parking. 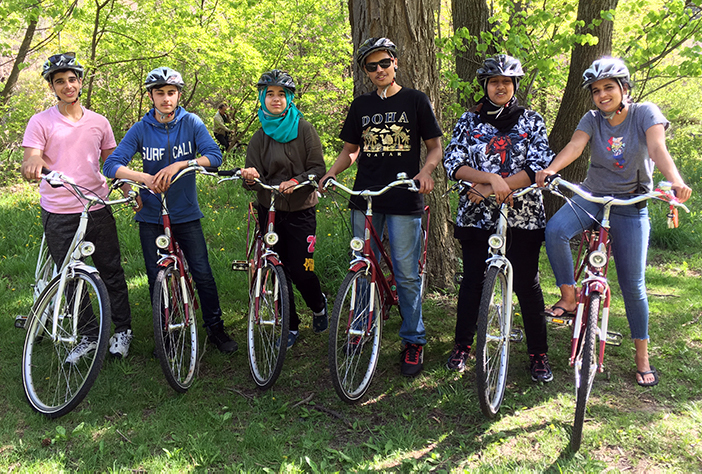 The 30 students and five teachers in Marc Garneau C.I.’s Bike Club immediately got to work. They wrote formal letters to Mayor Tory, Councillor Jaye Robinson, and Councillor Denzil Minnan-Wong, expressing their support for the bike routes and their dismay with the mayor's negative comments, and hand-delivered the letters to City Hall. Their letter made it clear: safe cycling is the present and future in Thorncliffe and Flemingdon, and the desire to replace safe bike infrastructure with parking spots is anything but unanimous in their community. “...now that we have cycled on the new bike lane routes, I can’t imagine going back to the way they were. Please John Tory, and councillors, think of the 1000s of people and students from Grenoble to Thorncliffe Park to Valley Park to Marc Garneau who use these bike lanes daily.” -Student from Marc Garneau C.I. Our AGM is just over a month away. 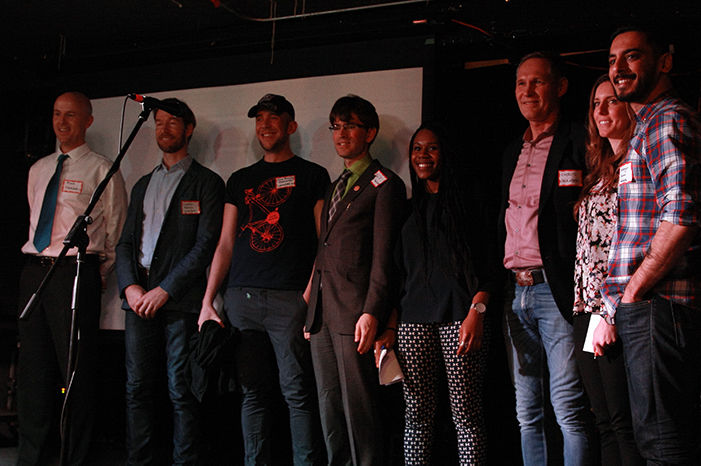 The Board of Directors serves a crucial role in the work that Cycle Toronto does. Every year as directors turn over, we are left with gaps in skills and experience that must be filled. The existing Board is in a unique position to assess what skills and experience are required for this work, what gaps exist, and which candidates might best fill those gaps. As a result, this year we will be interviewing candidates and recommending to our membership a slate of candidates for election. This is the process taken by most established non-profits and one that we believe strikes a balance between democratic openness and building an effective board. Regardless of which candidates the Board endorses, you are welcome to vote for any candidate! We strive to be fair and transparent and we appreciate your support as we attempt this new process. The Board of Directors is considering an application for charitable status with the Canada Revenue Agency, which it will bring to the AGM. The Board has been studying the issue for some time, in consultation with legal counsel and stakeholders such as the Advocacy Committee and Ward Group leadership. Charitable status would permit Cycle Toronto to continue public policy dialogue and development (advocacy) while also creating exciting opportunities for growth as the organization matures beyond its 10th year. The Board will be circulating more information about what this means for the organization, including a Q&A, in the coming weeks. The Board will also provide opportunities for members to give further feedback as the AGM approaches, and will also make a presentation on the issue. Our AGM is a members-only event. Take five minutes to join beforehand, or at the door. 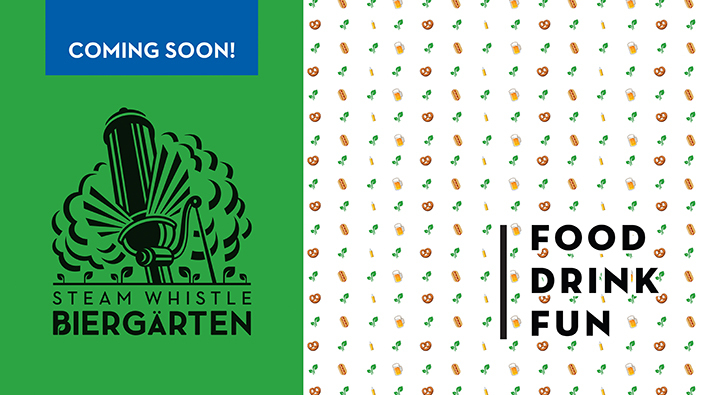 Steam Whistle is set to open their Biergarten this spring at 255 Bremner Blvd. What’s it all about? The Steam Whistle Biergarten is a Classic European Beer Hall food with a North American twist, taking inspiration from the European beer gardens and beer halls of great cities such as Munchin, Germany. The atmosphere and vibe promotes openness and sharing. Transportation connections: the John Street Roundhouse, home of Steam Whistle Brewing and Steam Whistle Biergarten was built in 1929 and is unique to Canada as it is one of the only remaining steam locomotive repair facilities. The building is comprised of 32 engine bays laid out in a radius to make up the buildings nature “round” structure. Adaptive reuse of this historic building is no stranger to the team. Operating out of the John Street Roundhouse for nearly two decades, experience with the intricacies and level of detail necessary to preserve the heritage fabric has inspired the beautiful balance of new and old aesthetic. Clean air commute: sustainable commutes to the brewery is encouraged with their proximity to local bike paths, transit and commuter trains. Steam Whistle provide showers, towel service and covered bike racks for their staff. They have supported cycling in the larger community by creating a network of Public Bike Repair Stations in 30 communities across Canada. Steam Whistle's Biergarten and new event space is coming soon. Tonight (and every Thursday), 4:00-7:00PM: DIY Drop-in Repair with Scarborough Cycles, AccessPoint on Danforth, 3079 Danforth Ave.
Tuesdays, 4:00-7:00PM and Saturdays 10:00AM-1:00PM: DIY Drop-in Repair with Scarborough Cycles, Lawrence-Orton, 3939 Lawrence Ave. E.
February 20, 7:00-9:00PM: Ward 14 Bikes Meeting, Frankland Community Centre, 816 Logan Ave.
February 27, 7:30PM: Bike Minds Episode #6: Bikes+Career, Fix Coffee + Bikes, 80 Gladstone Ave.
March 26, 7:00PM (registration begins at 6:15PM): Cycle Toronto's AGM, Cadillac Lounge, 1296 Queen St. W.
You're receiving this email because you subscribed online or at an event for "Ring and Post" Newsletter. You can add other email subscriptions . You can unsubscribe from "Ring & Post" emails. You can stop receiving all email updates from us .